You can do a lot of weathering with nothing but acrylic paints. Increasing your skills by using other mediums including oils, pastels, weathering powders and good old RustAll increase the looks and realism of your work. The techniques I’ve used to generate the weathering effects are not speedy, but they do give me great satisfaction and produce great effects. For the top down phase I use the roof weathering to set the general decrepitude of the car. The longer the car has been in service, or since its last refurb, the greater the weathering. The roof weathering also effects the side and end weathering of the car (as the rust run off to the sides and ends during rain and so on). It is worth thinking of the traction pulling your cars. If you model the steam era, or under catenary, your weathering will be different. 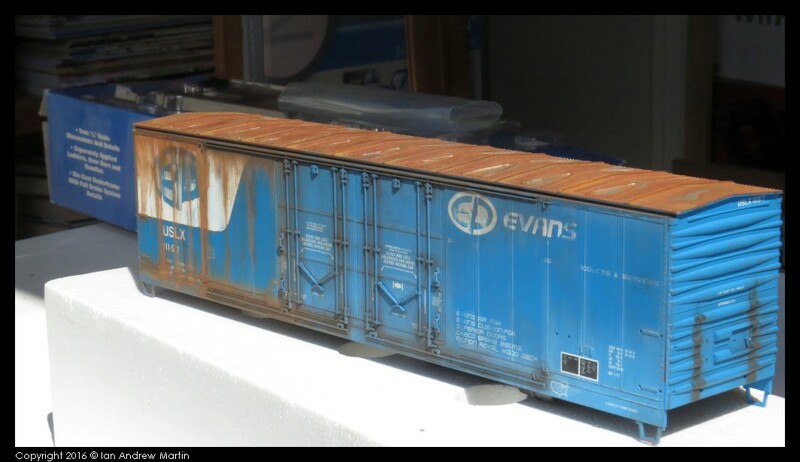 Head over to part 5 of my Multi-Media Weathering tutorial (Weathering a diesel era freight car roof) to read through the process. Bottom up weathering is dependent on the area you are modelling, and where ‘primarily’ your car runs. Cars running mostly in the Pacific northwest of the USA will weather in a manner different to those running in Texas, and the drier Southwest of the USA. Similarly those running in the Gulf Coast regions and in the Florida lower East coast will differ in their weathering treatment. Understanding how your cars were used, their lading and handling, and their areas of operation make for a more interesting (in my opinion) subject to weather. Weathering mainly consists of understanding how dirt, mud and wheel/rail crud effects the painted surface of the car. Hence the importance on knowing where the car mainly runs. Head over to part 2 (underframes), part 3 and 4 of my Multi-Media Weathering tutorial to read through the process. Weathering from lading and handling is mainly going to be rust. Every time a forklift knocks the inside or outside of a car, metal is bent and paint is damaged and the ingredients for rust come into play. There is a lot of scope here for creative and innovative expression. Always use a photo of a car that is the same or similar to your model. Lead based paints, and acrylic paints fade and fail in different ways and understanding the difference is critical to getting realistic weathering finishes. Lead based paints tend to fade very slowly due to the nature of the paint. They’re toxic but they last better than acrylic paints over the long haul. Unfortunately they are toxic. Acrylic paints differ in that as a plastic they are severely affected by UV. They break down quicker (think of the kids toys that you’ve seen left outside in the sun and rain and the effect to the colours and finish). Head to the weathering pages on this site for more information and images.